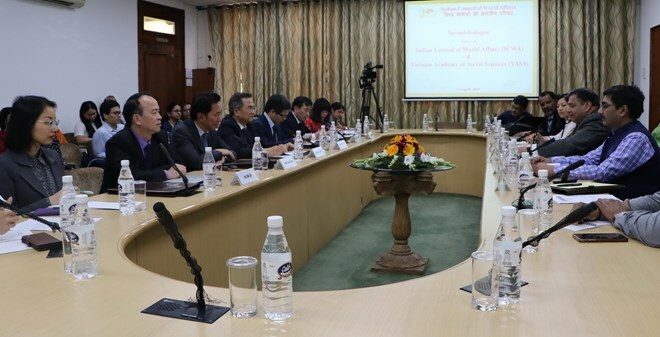 New Delhi (VNA) – The Indian Council of World Affairs (ICWA) and the Vietnam Academy of Social Sciences (VASS) opened their second high-level dialogue in New Delhi on April 3 to discuss the two countries’ cooperation. The two-day event features panel discussions about Vietnam and India’s cooperation to cope with regional and global challenges, partnerships in economy and development, and people-to-people exchange. Participants looked into the countries’ viewpoints on the changing roles of powerful nations in the regional architecture, advantages and difficulties for bilateral trade and investment, along with aspects of the bilateral partnership at present and in the future like science-technology, culture and education. ICWA Director General Dr. TCA Raghavan reviewed major landmarks in Vietnam-India relations, stressing that trust, goodwill and common interests and values are the main pillars of their friendship. He also appreciated the VASS’s sending of many senior cadres, including a Vice President and three directors of the academy’s institutes, to the dialogue, which shows Vietnam’s appreciation of the importance of academic exchanges to help foster the two countries’ ties. For his part, VASS Vice President Dr. Dang Xuan Thanh affirmed that Vietnam and India not only share similarities in cultural, religious and faith values but also have the common desire for peace, stability, cooperation and development in the region. Bilateral ties are flourishing on the basis of mutual trust and understanding, he noted. He added that this dialogue is a good chance for both sides to share viewpoints and seek measures to lift Vietnam-India relations to a new height.